Photographs by Mark Klett. Foreword and essay by Christopher Youngs. Afterword by Jon Burris. 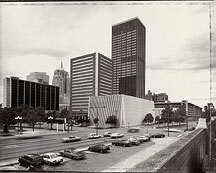 Oklahoma City Art Museum and Portfolio Editions, Oklahoma City, USA, 1991. In English. 64 pp., 51 duotone illustrations, 12x11".